2018This book is a collection of Yu Hua's essays and speeches all over the world in recent years. 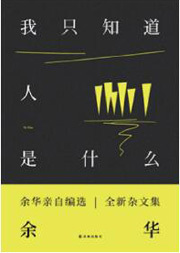 This book is a collection of Yu Hua's essays and speeches all over the world in recent years. With wit and sincerity, the author shared his observation and thinking of everything, from the past to reality, from himself to the current world, including both his daily experience and literary principles. He recalled how he encounters his beloved characters in writing, as well as his stories with farmers in Holland and patients in Italian mental hospital. He also takes down his experience with English, Italian, Danish translators of his works. All of them have their distinct personality yet share common features. The broad and rich explorations of human nature reveal the writer's deep insight into life, his detachment after understanding everything. His stories condensed from the fickleness of fate not only connect our past and future, but also ultimately point to the most fundamental source of power in all literary and artistic creation. ·The latest anthology of articles chosen by Yu Hua. ·As a representative of contemporary Chinese literature going global, Yu Hua has been invited to attend speeches and activities all over the world.